Sripada was born in the early hours of Ganesh Chathurdhi in 'Chitra' star, in Simha (Leo) Lagna and Tula (Libra) raasi. 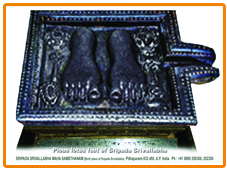 About Sreepada it was mentioned that He was an incarnation of Sree Datta, and as His Feet were marked with all Auspicious Features, He Bears a Worthy name as Sreepada Sreevallabha. It was further noted that His Horoscope should not be given to anyone and that it will reach in course of time through Akshya Kumar of Tripura Belonging to Jain religion. 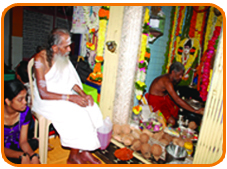 All that would happen according to Divine plan and it would reach Pithapuram as a part of Divine play. When Sreepada Sreevallabha was born, a cobra with three hoods was holding its hoods as an umbrella where ever He was kept for 18 days. Sripada Srivallabha came out of the mother′s womb as a dazzling illumination Sumati Maharani Fainted Immediately after he was Born. Auspicious Musical notes from Musical Instruments were heard from the labour room. After some time an invisible voice warned all the people to leave the room. 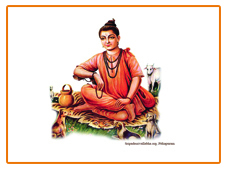 Four vedas, eighteen Puraanas, Great Persons Arrived in the shape of brilliant lights to Great Sreepada. Sacred Vedic Mantras were heard outside the room. Silence Spread after sometime.